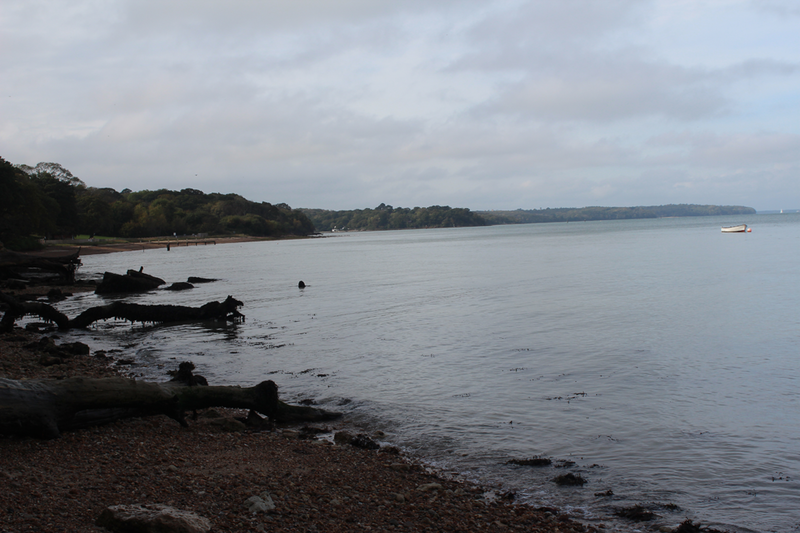 Bounded, dense, impish, intense … all words which surfaced in discussions about the Isle of Wight when Miranda and Anwen met up with local researchers to discuss the potential shape of the Englaid project case study. During a fleeting visit, we traversed the island, trying to absorb its tremendous variability. We traveled from a benign north coast, where England felt so close and where wooden trackways, fish traps and post alignments have been assembled in the intertidal mud since the Neolithic period, to an almost malevolent southern one, where Iron Age and Roman burials have been recovered, numerous ships have been wrecked, and where the sea was whipping itself up into a weekend storm. We were struck by the strong presence of the geological basis of the island, running broadly in strips from east to west. Yet it was also clear (and became more so through our discussions with researchers) that the east and west of the island had distinct characters – closed and open, respectively, in feel. 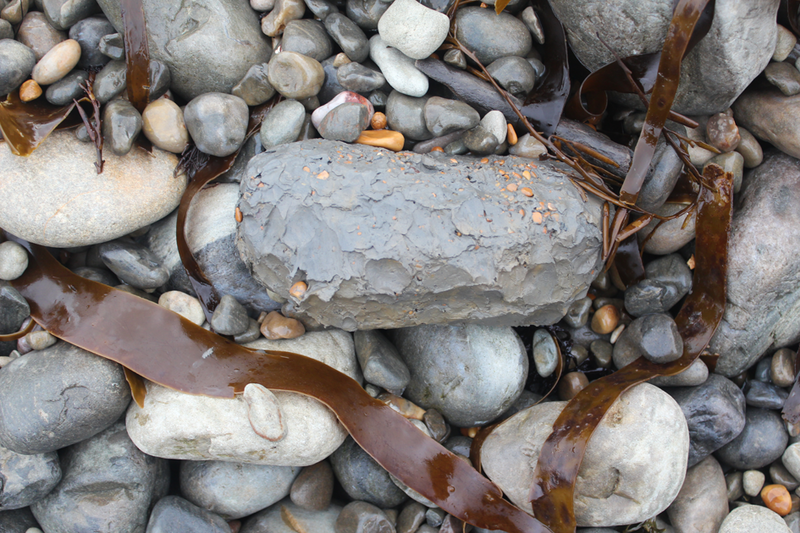 We focused on some of the island’s fabrics – clay, sandstone, limestone, chalk, flint. 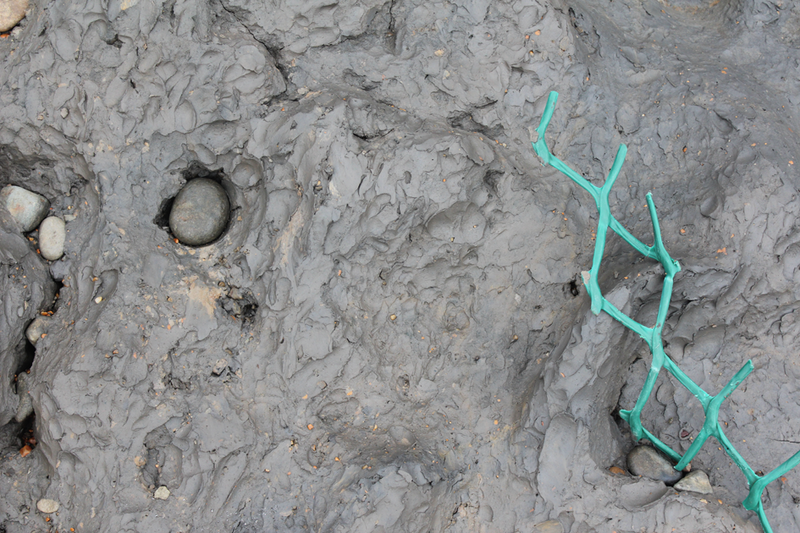 Miranda drew lines with beach clay and mudstone. 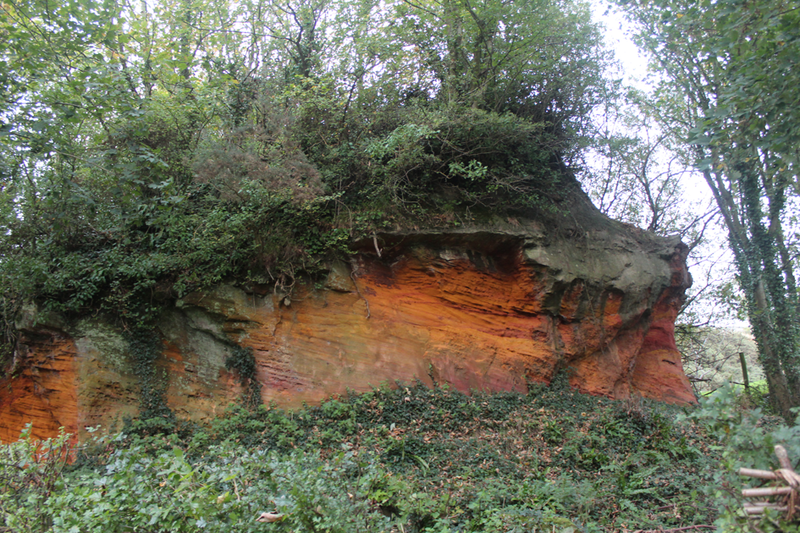 This fiery sandstone outcrop caught Anwen’s eye as we flashed by. 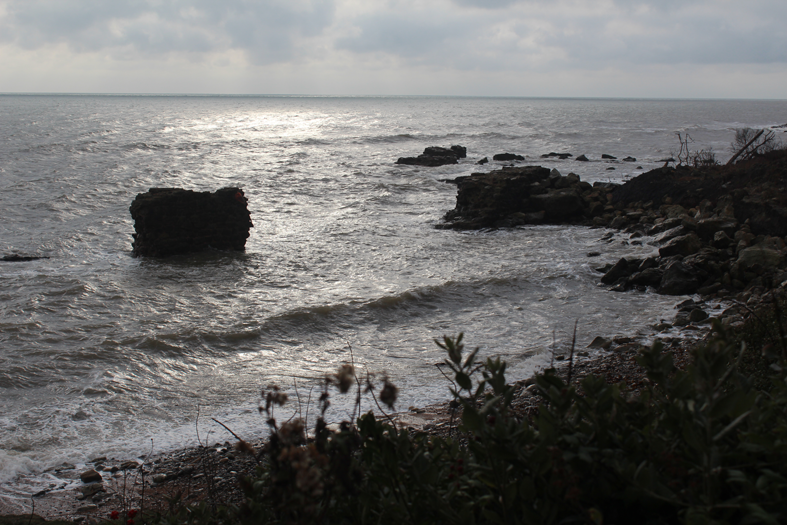 We were impressed by the force represented by the sea and pebble battered clay along the undercliff coast – pebbles pressed into the clay and even clay pebble pummeled out of its matrix. 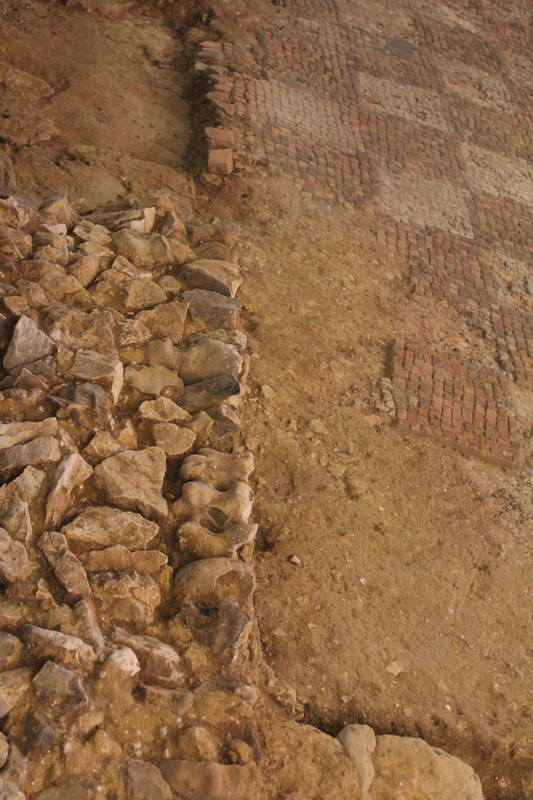 Also striking was how materials gathered from across the island’s landscapes were assembled in its architecture – in Roman villas and more recent farm buildings. The Isle of Wight landscape, and islanders’ relationships with this landscape were apparently condensed within its buildings. During our very productive discussions with researchers Frank and Vicky Basford, Becky Loader, Rosie Edmunds and Owen Cambridge we were able to crystalise some of these thoughts. We discussed the rapid rate at which finds data, particularly coins, are currently being produced on the island; how having a distinct edge (the coast) had affected the character and development of the island’s archaeology; and how islander’s contacts with mainlanders on both sides of the Channel had toed and froed over our study period. We came away armed with further lines of enquiry to follow, a plastic bag of bluish clay, some rapidly penciled line drawings, and an appetite to return for a more sustained visit! Over the last few months, the Englaid researchers have been beginning the process of engaging critically with the mass of evidence we have brought together for case study areas. One outcome has been the production of case study evidence summary sheets – a useful way of considering and collating key qualities of the different evidence types available for these areas. 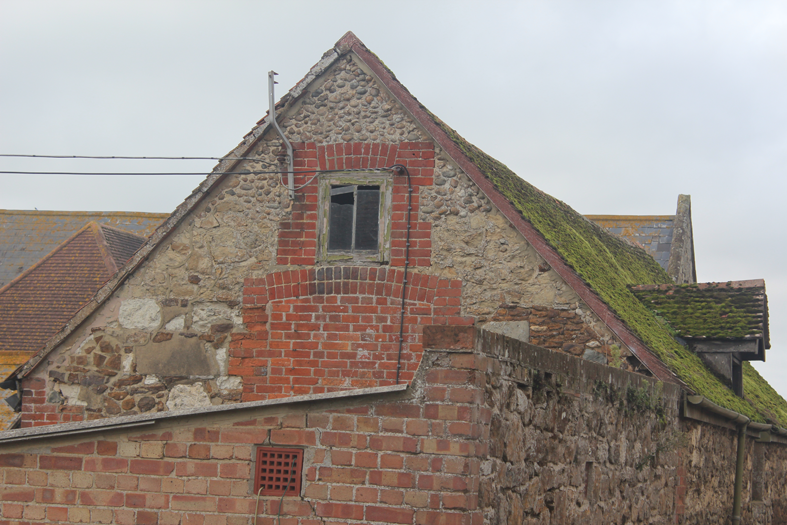 For some case study areas (for instance in Cornwall and the East of England) we’ve also been liaising closely with local researchers so that we can try to link our own investigations into local research programmes – building on or making connections with existing, ongoing and imminent projects. Unsurprisingly, now that we’ve started engaging in earnest with the vast body of data we’ve assembled, we’ve had some interesting discussions about how to integrate and also how to fulfill the research potential of the various evidence sets. This is obviously much more of an issue in case study areas where we will be viewing and analysing evidence at a site level, rather than through the coarser lens of 1km squares. For instance we’ve been thinking through methods of refining or cleaning data and also of enhancing it in various ways. We’ve also been considering at what level/scale ‘cleaned’ data becomes analytically visible or relevant (more to come on this …). From this point onwards we’re hoping to provide regular updates on the blog regarding how we’re getting on with the case study analysis. 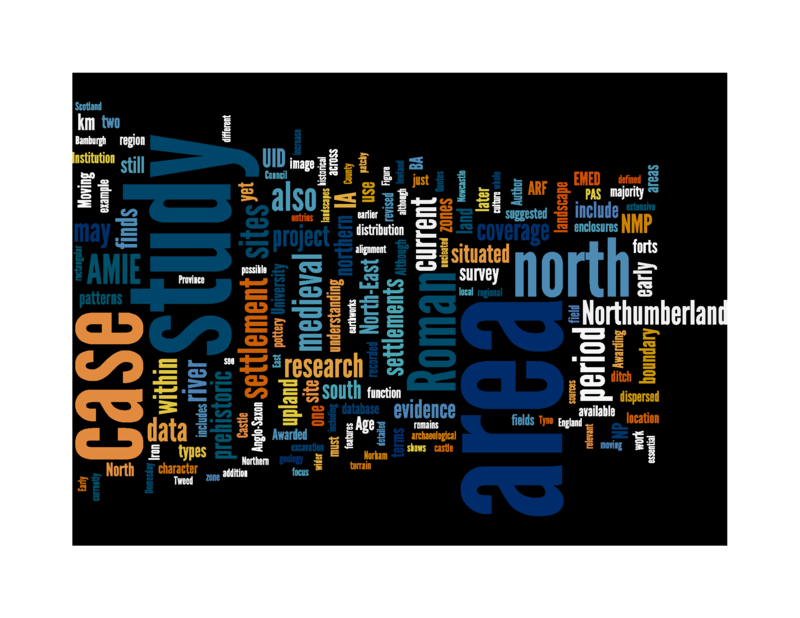 For now, it’s worth mentioning that our initial rummaging about with the evidence from case study areas, has generated a slightly revised case study map (which Chris Green has kindly visualized for us). Chris Green and I also thought we’d have a play about with how to produce ‘snapshots’ of the case study evidence using the text from the data summary sheets and medium of tag clouds (http://www.wordle.net/create). 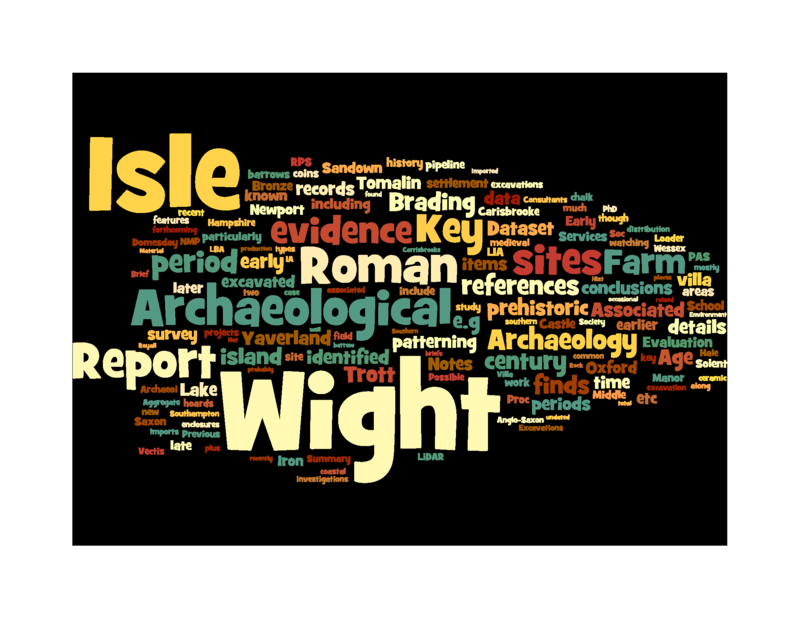 Overall, we quite like the outcomes, especially once you start refining the tag clouds – grouping words into phrases like ‘watching brief’, removing the name of the case study area, and removing generic words like ‘archaeology’, ‘archaeological’, ‘site’, ‘report’ etc. (which I only did for the Isle of Wight and obviously you could fiddle about with this some more!). The way in which geological information, the names of key sites and local researchers, evidence types, the structure of the documents themselves (headings and subheadings), and even the names of places which have strong research links with the case study area (in the case of the Isle of Wight, Oxford) become (more or less) evident and are juxtaposed is interesting. We also think that they work well as pithy reminders of some of the key traits of the case study areas. Almost there with data collecting! Many thanks to the various people who have provided data for the Englaid project over the last month. It really feels as if we are coming to the end of the data gathering stage of the project now and can begin to work with all this information, which is quite exciting. With a few exceptions (mainly due to changes of personnel and HER closures) we now have the HER data for the vast majority of England (see below). We are particularly grateful to Julia Wise (Buckinghamshire), Ian Scrivener-Lindley (Chichester), Gill Stroud and Nichola Manning (Derbyshire), Claire Pinder (Dorset), Pete Boland and Jennifer Mincher (Dudley), Alison Bennett (Essex), Andrew Armstrong (Gloucester City), Mark Bennet (Lincolnshire), Susan Lisk, (Oxfordshire), Alison Yardy and Richard Hoggett (Norfolk), Chris Addison (Northamptonshire), Ben Wallace and Caroline Rann (Solihull), Ken Crowe (Southend on Sea), Suzy Blake (Staffordshire), and Ben Wallace and Caroline Rann (Warwickshire) all of whom have sent HER data through to us over the last few weeks. Thanks, once again, to Keith Westcott at Exegesis for his continued efforts to assist HER professionals in processing the Exegesis data query. 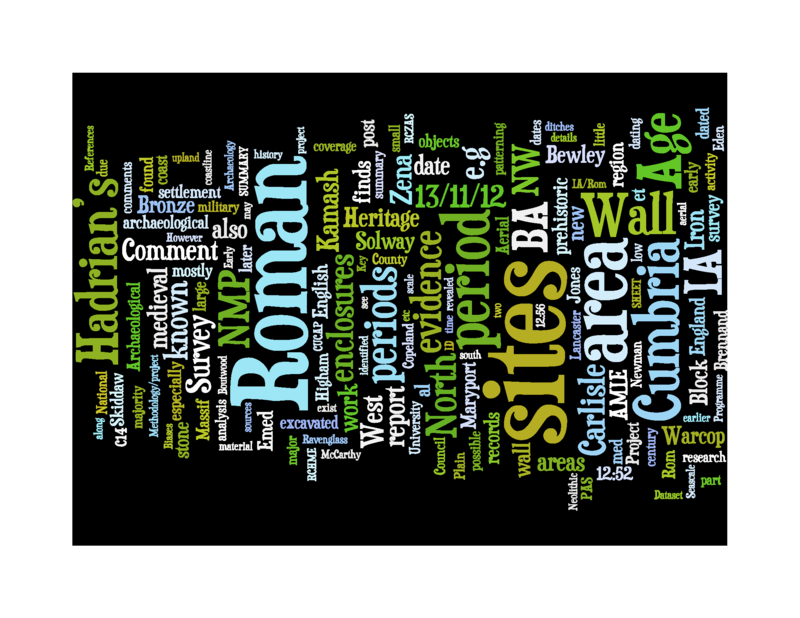 Further thanks go to Simon Crutchley and Poppy Starkie at English Heritage who have provided additional tranches of NMP data (we now have NMP data for all but the north west and north east of England), and to Caroline Keay and Sara Larman at the National Soil Resources Institute (NSRI), Cranfield University, who have kindly provided digitised maps of the 1983 soil survey of England, which (as you’ve probably gathered from Chris Green’s recent postings) have provided plenty of food for thought! Author anwenc2012Posted on 2 August 2012 6 September 2012 Categories Project newsTags HERLeave a comment on Almost there with data collecting! Over the last month, members of the Englaid team have been involved in a couple more regional HER meetings and have engaged with the broader research community at a workshop in Oxford on Landscape and Scale (more to come on this in a separate posting …). Firstly, we would like to thank those who hosted to the south west and eastern regional HER meetings – in particular Chris Webster in Somerset and Vanessa Clarke in Bedford Borough – for having us along to these forums. We are also extremely grateful to all who attended these meetings for providing such thoughtful and constructive feedback on the project’s work so far as well as on its broader aims – your collective input is very much appreciated and as the following discussion hopefully shows we are considering your suggestions very carefully. The provisional results are illustrated below (the original case study areas are outlined in pale yellow). 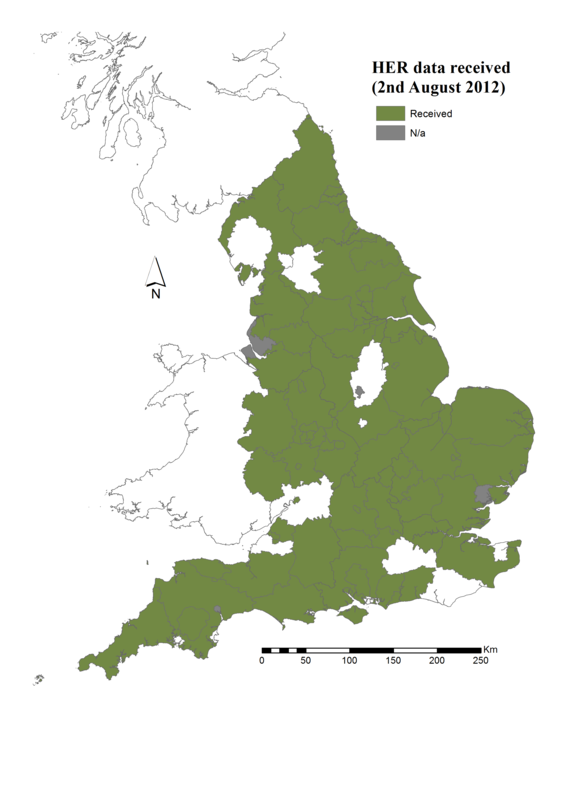 The main outcome of this broader consultation is that many of those we have talked to felt that it was important for our case studies to traverse different landscape zones rather than focusing on areas defined either geographically (such as the Yorkshire Wolds) or by modern political boundaries (counties such as Suffolk or Norfolk). One particularly bold consequence of this is the new case study area which traverses the middle of England from east to west (a suggestion which came from the East Midlands regional HER meeting – thanks in particular to Ken Smith of the Peak District National Park Authority). 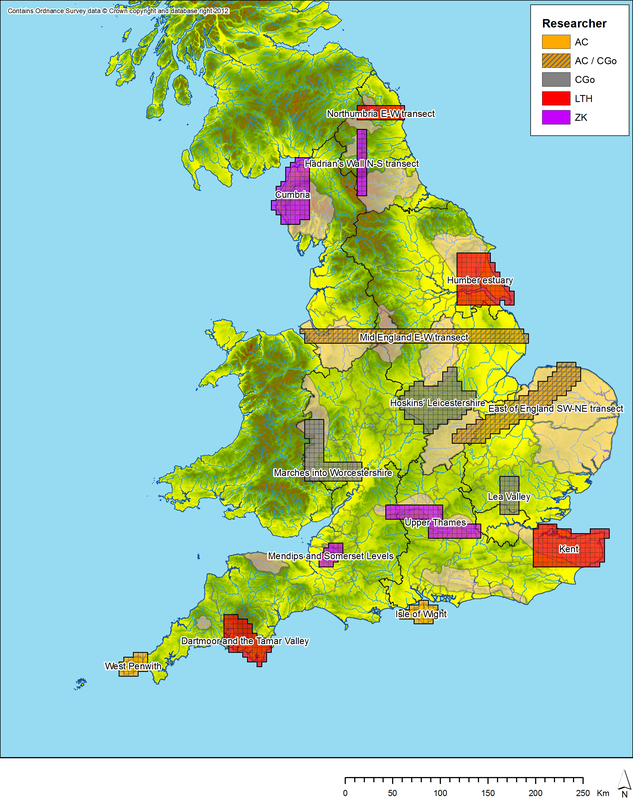 We have also included a greater number of river valleys (for instance the Alne valley in Northumbria, the Lea Valley in Hertfordshire, and the Humber estuary), and a distinct island – the Isle of Wight – in part, to balance out a previous emphasis on upland areas. Two more interpretatively-led additions are a case study revisiting Hoskins’ Lincolnshire, rendered so evocatively in his seminal work The Making of the English Landscape, together with a strip of land traversing Hadrian’s Wall in order to explore the affects of this substantial piece of landscape architecture. It is also worth emphasising that the revised case studies are not fixed. Other than the case studies which we have already begun work on – the Dartmoor and Tamar Valley, Devon, and the Mendip Hills, Somerset – we would continue to welcome further ideas regarding the areas we have (re)defined. However from this point onwards, most revisions we make to the case study areas are likely to be exercises in fine-tuning rather than substantially reworking. Finally, we have received another wave of datasets over the past month and would like to express a huge thanks to those involved in producing them. We are extremely grateful to Victoria Brown (Humber), Stuart Cakebread and Mel Bell (Greater London), Nick Crank (Milton Keynes), Sally Croft (Cambridgeshire) Ben Croxford (Kent), Lucie Dingwall & Melissa Seddon (Herefordshire), David Evans (S Gloucestershire), Jonathan Goodwin (Stoke), Teresa Hocking (Berkshire), Beccy Loader (Isle of Wight), Sarah Orr (W Berkshire) John Oxley (City of York), Sheena Payne-Lunn (Worcester), Colin Pendleton and Sarah Poppy (Suffolk), Rachel Salter (W Sussex), Mike Shaw (Black Country), Isobel Thompson (Hertfordshire), Liz Williams (Northumberland) and Julia Wise (Buckinghamshire) for sending through the HER datasets for these areas. Thanks, once again, to Keith Wescott at ExeGesIS for his continued support with processing the Englaid query for HBSMR-users. 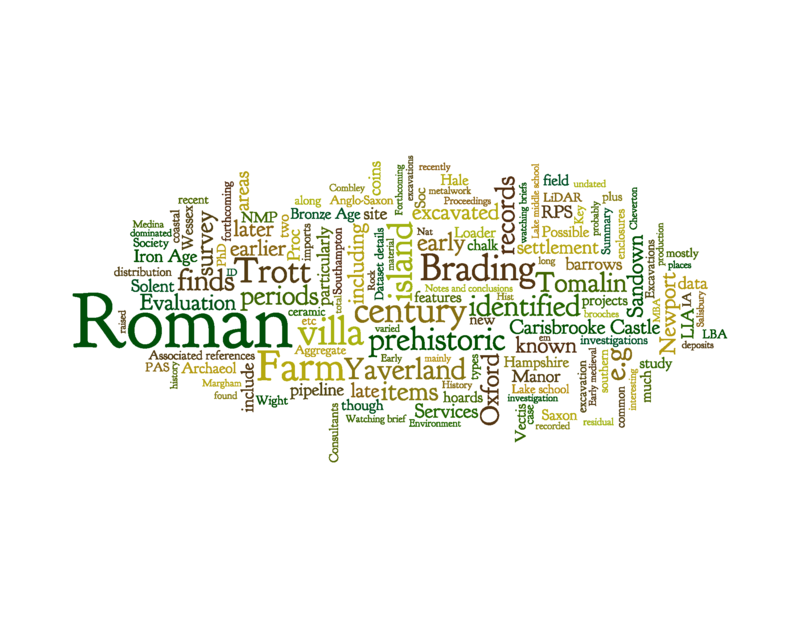 The receipt of a new tranche of NMP data from English Heritage for the East Midlands region is much appreciated – we have now collated the NMP data for roughly half of England and are very much enjoying exploring its potential. One other more specific dataset we have kindly been given is Janice Kinory’s database of (mainly later prehistoric) salt-working sites, produced as part of her doctoral research. As the attendees of recent regional HER meetings have seen, we are now in a position to start interrogating in further detail the correspondence between various datasets and also their particular qualities. 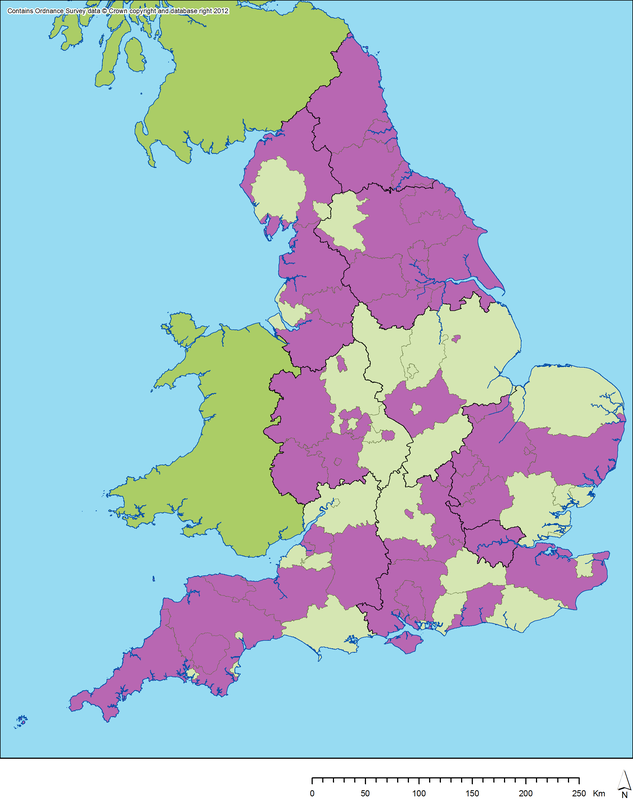 Many thanks to HEROs across England for their recent efforts to collate the Englaid data – we have now received data from almost half of the English HERs (see below) . Particular thanks go to Graham Lee (North York Moors), Louisa Matthews (North Yorkshire), Rebecca Casa-Hatton and Sarah Botfield (Peterborough City), Rob Edwards (Cheshire), Jennifer Morrison (Tyne and Wear), (Exmoor), Stephen Coleman and Sam Mellonie (Luton & Central Bedfordshire), Vanessa Clarke (Bedford Borough), Dr Mike Hodder (Birmingham), Graham Tait (Devon and Dartmoor), Alison Bishop (Sandwell), Jason Dodds (West Yorkshire), Ingrid Peckham (Southampton), Alex Godden (Hampshire), Ian Scrivener-Lindley (Winchester), Jo Mackintosh (Cumbria), all of whom have sent through data in the last couple of weeks. Following advice from several HER officers, the commissioning by the EngLaId team of an ExeGesIS query has, as hoped, greatly facilitated the process of extracting the EngLaId data for HER officers using HBSMR software (at least 75% of English HERs). Regarding this, we are greatly indebted to Keith Westcott (ExeGesIS) for facilitating both the creation and application of this query. Equally, we would like to say that we appreciate doubly the efforts of non-HBSMR-using HER officers who have produced the EngLaId data without the aid of a specifically written query. Finally, we are extremely grateful to Dave Yates who has provided us with a database of Later Bronze Age sites in southern England (as of 2003) drawn from the results of developer-funded archaeology. These data provided the basis for his 2007 volume Land, Power and Prestige. The EngLaId IT specialists are now busy uploading all these data into the project database. Meanwhile the EngLaId researchers are really looking forward to analysing them in detail! Author anwenc2012Posted on 18 May 2012 6 September 2012 Categories Project newsTags HERLeave a comment on A flood of data! A productive week or so! The last couple of weeks have been very productive for the EngLaId team in many respects. We are extremely grateful to Nick Boldrini, Lesley Mitchell, and Bryn Tapper from Durham, Greater Manchester and Cornwall HERs respectively, for extracting HER data for their areas for the EngLaId project. Bryn and Nick have been really helpful both in terms of providing detailed advice about the HER data from their areas and offering useful suggestions with regards to some of the project’s future outputs. We are particularly grateful to Lesley for managing to extract the data for the project prior to the temporary closure of the Greater Manchester HER while it relocates to Salford. EngLaId’s recent progress with populating the project database has been assisted greatly by the commissioning, at the suggestion of Mike Hemblade (North Lincolnshire HER) and Penny Ward (Shropshire HER), of an ExeGesIS query to extract bulk downloads of HER data from HERs using HBSMR software (http://www.esdm.co.uk/hbsmr.asp). This includes the vast majority of HERs in England and more broadly. The query will hopefully facilitate greatly for HER Officers, the process of extracting the significant volume of data that the EngLaId project requires. We really appreciate the ExeGesIS team’s promptness in producing this query. More broadly, Chris Green (GIS) and John Pybus (eResources) had some good feedback on the papers they gave at the Computer Applications in Archaeology conference in Southampton (more to follow). 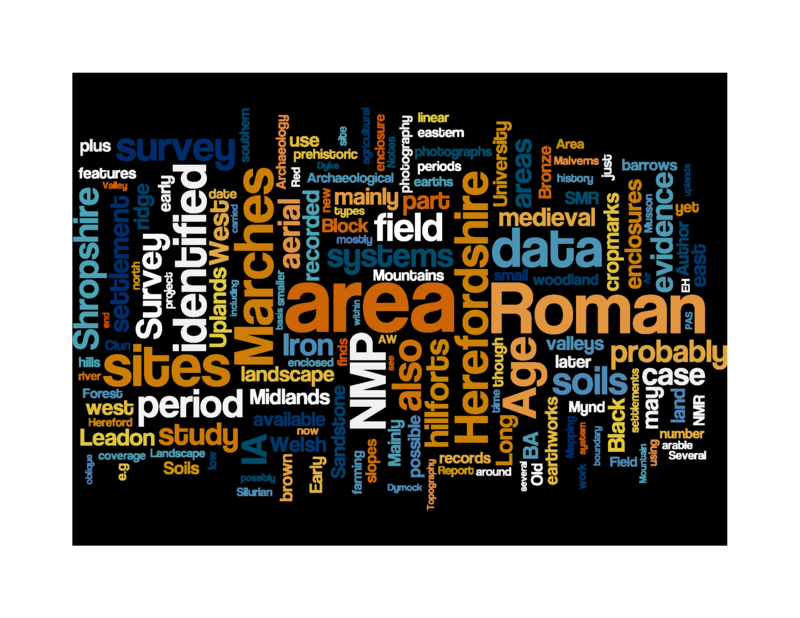 Letty Ten Harkel (early medieval researcher) is progressing well with her paper for the forthcoming international Landscape Archaeology Conference in Berlin (http://www.geo.fu-berlin.de/geog/fachrichtungen/physgeog/lac2012/). 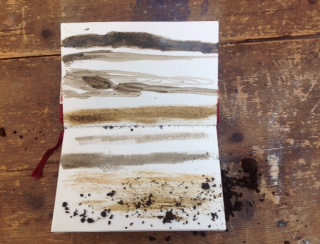 Meanwhile Miranda Cresswell (project artist) has been making the most of the sunshine and working intensively on drawings at both Port Meadow in Oxford and at Danebury Iron Age hillfort (see http://visualenglaid.wordpress.com/ for the latest updates). Finally, Laura Morley (research coordinator) thoroughly enjoyed her visit to Preston to the NW regional HER meeting on 28th March. As has been the case at all of the regional HER meetings the EngLaId team has participated in recently, the discussions held were very constructive. 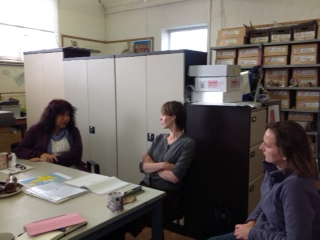 Helpful suggestions and advice from those involved regarding the project’s research plans were gratefully received. Author anwenc2012Posted on 30 March 2012 6 September 2012 Categories Project newsTags HERLeave a comment on A productive week or so!